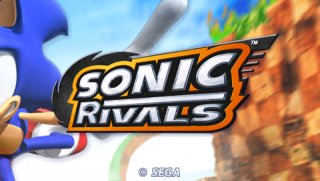 Sonic Rivals is a game in the Sonic the Hedgehog series, developed by Backbone Entertainment exclusively for the PlayStation Portable. This is the first Sonic game to be developed by a Canadian company, and the first to be released on the PSP. Sonic Rivals starts as a competition between Sonic and Knuckles, but expands as further rivals get added to the mix, including Shadow, Silver, and Metal Sonic. There are 7 types of power-ups, fire, ice, mine, illusion, wind, ring magnet, and star. The effects of each one are different for each character, though generally have similar outcomes. For example: the Fire power-up gives the character a fire attack, the Ice power-up gives the character an ice attack, and the Star power-up gives the character a special attack specific to that character. The game features a revamped power-up system, including both offensive and defensive abilities. Single player consists of a Story Mode, in which each of the four playable characters have separate story lines, and must race each other to the finish line in each stage in order to thwart Doctor Eggman's various schemes. Multiplayer mode is played ad-hoc, and players can customize their racers using collectible cards won in Single player, trade cards with friends, and wager cards on races. Boss battles at the end of levels require you to not only defeat the boss, but also prevent your opponents from defeating it before you. Badniks are featured as enemies, though some are similar to those of Sonic Heroes. Performing objectives throughout the game will give you collectible cards. Such tasks include getting a certain number of rings, hitting your rival a certain number of times and getting to the goal within a certain amount of time. Rivals features an extensive collectible card system that spans a total of 150 cards, featuring cameo appearances of robots, major characters, minor characters, box covers, and items from past Sonic games such as Sonic Heroes, Sonic Adventure, Shadow the Hedgehog, and even dating back to the original Sonic the Hedgehog. The cards themselves are used to unlock secret costumes for the characters among other things. 2006 Sonic Rivals | Sega Genesis Collection 2007 Sonic Rivals 2 2009 Sega Fun Pack: Sonic Rivals 2 & Sega Genesis Collection 2011 Double Rivals Attack Pack!